SGA Watches & Jewelry LLC. Jewelry For Less Group Inc.
Sold & shipped by Jewelry For Less Group Inc. Product TitleMens Rolex 36mm DateJust Diamond Watch Fully Iced Band Custom Blue Dial 5.10 CT. Product TitleLadies 18K / Steel Rolex DateJust Jubilee 6917 Diamond Watch Champagne Dial 1 CT.
Sold & shipped by SGA Watches & Jewelry LLC. Product TitleRolex 18K Gold President 26mm DateJust 69178 VS Diamond Champagne Watch 1.38 CT. 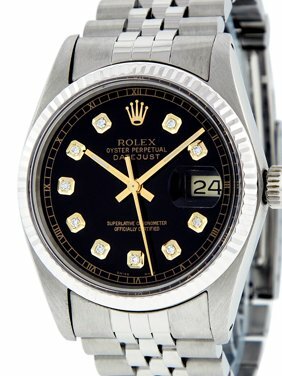 Product TitleMens Rolex 36mm DateJust Diamond Watch Oyster Steel Band Custom Black Dial 2 CT. Product TitlePre-Owned Rolex 18K Gold President 26mm DateJust 69178 VS Diamond White MOP Watch 1.38 CT. Product TitleMens Diamond Rolex Day-Date President 18k Yellow Gold Watch with Band 4 Ct. Product TitleRolex 18K Gold President 26mm DateJust 69178 VS Diamond White MOP Watch 3.70 CT. Product TitlePre-Owned Rolex 18K Gold President 26mm DateJust 69178 VS Diamond White MOP Watch 2.08 CT. Product TitleWomens Rolex Diamond Watch MOP Dial 6917 Datejust 18K/ Steel Jubilee Band 1 CT. Product TitleRolex 18K Gold President 26mm DateJust 69178 VS Diamond Champagne Watch 4.46 CT. Product TitleRolex 18K Gold President 26mm DateJust 69178 VS Diamond White MOP Watch 4.46 CT. Product TitleMens 41mm 116300 Rolex DateJust II Real Diamond Watch Black Stick Dial 2.75 CT. Product TitleLadies Stainless Steel Diamond Watch Rolex 6917 Datejust Oyster Black Dial 1 CT.